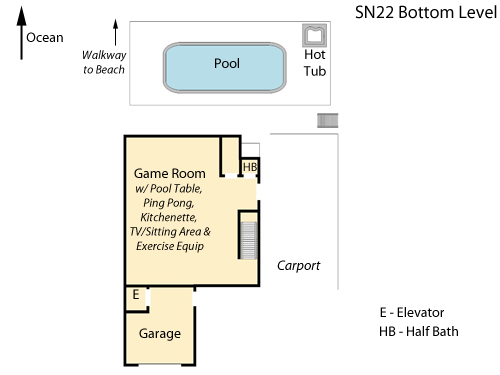 OCEANFRONT with amazing ocean views, private pool, and a hot tub...all on the wide sandy beaches of South Nags Head! Located 1 mile south of Jennette's Fishing Pier - easy walk or bike ride to restaurants and grocery store. Also, within sight of a manned lifeguard station. This family-friendly Outer Banks Vacation home is sure to please everyone in your group. SPACIOUS comfortable living featuring nine bedrooms, seven full baths, four half baths, and 1848 square feet of covered porches! The Fearing Cottage sits on an acres lot - a rarity with most cottages. Luggage and groceries are a breeze - just take the elevator! It is accessible to all three floors! LARGE PRIVATE POOL (16' x 34') with chaise lounges, picnic tables, and two outer door showers is served by the first floor, which features a bar with full refrigerator and an under counter ice maker (convenient for cold drinks and coolers on those sunny days), as well as 1/2 bath. The mid-level covered porch offers shade, Adirondack Chairs, and a picnic table with views of the pool and beach. SUSTAINABLE- Built in the Old Nags Head style with locally sourced Juniper and Cedar from Tyrell County, the Fearing Cottage is timeless. The kitchen features granite counter tops with a bar top made of reclaimed timbers from an old train station and cabinet from a western North Carolina School Library. Enjoy the surround sound in the living room. The cottage is furnished with an eclectic mix of antiques and contemporary furniture, so you can enjoy the life and sustainability of antique furniture without sacrificing the comforters of our modern life! 1st Level: The elevator has a 34-inch wide door and 2-inch lip. It is entered from the garage entrance and goes to all floors. The pool is easily accessible by a ramp, and the brick area around the pool is very spacious. There is also direct access to the pool from the driveway. A spacious den offers plenty of room to get around. 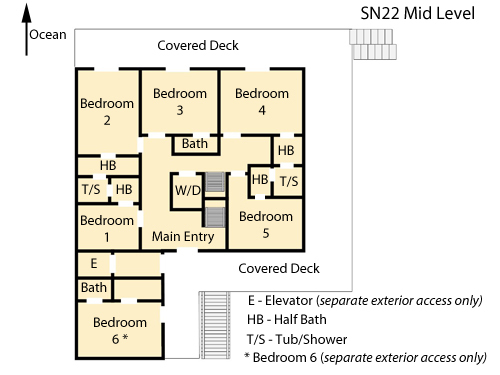 2nd Level: Spacious bedrooms and hallways throughout. 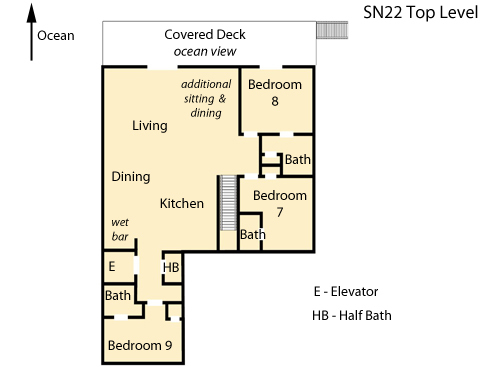 3rd Level: The top level living area and bedrooms are very spacious. The deck is accessed through a 30-inch slider. The king master bedroom on the west side of the house is quite spacious, with wide doorways. The master bath features a shower with 5" lip, built-in shower seat and handrails, and installed shower nozzles. The pedestal sink offers 27" of clearance underneath. The toilet is 16" high with a 10" clearance on both sides. There are no rails on the toilet. A toilet seat riser and additional stool are available as well. The home is beautiful and we enjoyed our stay. Maybe being the first guest of the season has disadvantages. no access to beach, sand dune covered access. Small issues like towel and toilet paper hold fell off. Kitchen is stocked with beautiful equipment. good idea to remind guests to bring toilet paper. Overall I liked the cottage, especially the open great room. It was great having all the seating for our meals too. The views of the ocean were wonderful and you have a really nice pool, though it would be nice to have handlebars on the steps. The appliances need updating as not all the burners worked on the stoves, there was an issue with the ice maker on the refrigerator and the dryer took a long time to dry. The bedroom I was in on the second floor with the queen bed had a tv that was very old and it didn't work as stated on the message taped to it. I had looked forward to using it. Thank you for your comments. Here on The Outer Banks bugs are a common occurrence, but to help combat this the home is on an annual preventive pest control plan. Please feel free to call us in the future should you have any unexpected issues. As we will do our best to remedy. First time renting from VR and service was excellent. Home could use an assortment of drinking glasses and we had to call for a second coffee pot. Should spray for bugs. VR should have a thorough checklist ( in my opinion) of entire home prior to new guests arriving. Overall experience was very good and we would come back. The eclectic furniture pieces throughout the house are a nice touch. VR poeople are GREAT!